SnapSwap presents its digital onboarding solution Snaprove ™ to customers and partners of Mastercard at the Start Path Summit in Miami. More than 300 customers and partners of Mastercard are attending the event, including C-level executives in banks, e-commerce and in the tech industry. SnapSwap CEO Denis Kiselev speaks at the opening panel on Digital Enablement in financial services. SnapSwap will bring its expertise during the panel session regarding customer onboarding and how Snaprove facilitates the onboarding process while improving the overall user experience in full compliance with AML/KYC regulations. Start Path Program is a Mastercard program with the purpose of working with later-stage startups from around the world, and help companies to gain access to Mastercard’s global ecosystem and to break new markets through Mastercard’s relationships. CEO of SnapSwap Denis Kiselev is invited as guest speaker to the panel AML/KYC landscape 2018 and beyond – is technology changing the approach to KYC/AML/KYD”. The panel raises questions about how technology transforms KYC/AML/KYD approaches in the fund industry and how it drives efficiency. Denis shares insights about innovation in the KYC/AML landscape and explains how digital customer onboarding can benefit the fund industry especially regarding fund account openings. The conference Technology: how to use the accelerating advances in Fund TA & Distribution Operations, organized by ALFI in partnership with the LHoFT, gives numerous in-depth sessions and workshops about the latest digital trends. It targets fund business specialists and aims to discuss topics to find sustainable solutions to central issues concerning the future of the Luxembourg investment fund industry. 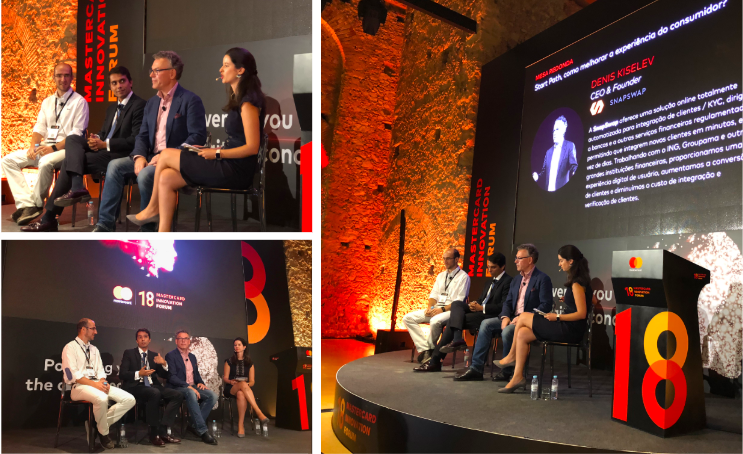 SnapSwap CEO Denis Kiselev speaks at Mastercard Innovation Forum 2018 in Lisbon on September 25. The event theme is “Powering you in the digital economy”. SnapSwap presents Snaprove™ customer onboarding solution to key players from e-commerce, banking and payments on the European market. We share insights about how to streamline the process of customer onboarding, improve the user experience while reducing fraud and customer-related risks with a fully automated end-to-end solution. The Innovation Forum is one of the recurring MasterCard events around the globe that bring together partners and thought leaders to exchange ideas, share challenges, and discuss best practices in the payments industry. Industry experts share their vision on how to meet the challenges of the digital economy. SnapSwap and EGAAS signed a service agreement to launch the Apla Blockchain Platform and begin the sale of APL tokens (internal tokens of the Apla platform). As part of the arrangement SnapSwap will allow its clients to buy and sell a virtual currency of the platform named “APL” using the existing payment infrastructure of SnapSwap to process payments in fiat currencies. These payments in fiat will fall under the European electronic money license currently held by SnapSwap. Along with the payment service, SnapSwap is offering KYC onboarding for Apla’s platform users, which allows to identify, authenticate and onboard them. This project is expected to develop the blockchain industry and to foster innovation within the economy. Apla is an original and fully functional blockchain platform developed by the EGAAS team that will be ready for launch in Autumn 2018. SnapSwap CEO Denis Kiselev presents digital KYC solution to major banks and other financial institutions from Latin America at Cyber Security Summit in Mexico on 21 August 2018. Cyber Security Summit is an annual event organized by Mastercard, in partnership with Forbes Mexico for key executives, influencers and decision makers from the financial industry of the LATAM region. This second edition is focused around subjects of safety and security in the world of payments. International experts and speakers are joining the summit to discuss new security challenges and the best practices to handle them. As one of the finalists of ING FinTech Village startup accelerator, SnapSwap pitches in front of ING teams and directors to present Snaprove™, its customer onboarding solution. After 16-week of intensive mentoring classes and preparation, SnapSwap built a Proof of Concept (POC) to test its product in a real banking environment. The product aims to solve business challenges ING is currently facing, and shows the growing commitment of the bank to be involved into innovative projects with FinTech startups. SnapSwap's selection shows once again the traction of its digital customer onboarding solution in the financial market, and further consolidates its position on the Belgium market as an online identity verification service provider. SnapSwap participates to CeBIT in Hannover, the leading business event for the digital world, which takes place from June 11th to 15th 2018. This business festival for innovation and digitization is the largest and most internationally representative computing exhibition. CeBIT has redefined itself around 3 key words: business, leads and ideas. Its desire is to cover the digitization of business, government and society from every angle. From cloud technology and IT security to big data and the Internet of Things, CeBit covers all the most current and relevant market trends in the industry. SnapSwap is exhibiting at D!tec, the meeting place for radical ideas and technologies that transform society and the economy and will be part of the Chamber of Commerce of Luxembourg Pavilion. This participation is the occasion for SnapSwap to access to international markets and clients. CeBIT’s will is to connect corporations, young entrepreneurs, startups, investors and politicians and create a synergy between them. Moreover this is the occasion for SnapSwap to present Snaprove™, the digital customer onboarding solution during a pitch session on Tuesday 12th June, 12.30pm. If you want to meet us, do not hesitate to join us on the Hall 27, Stand E69 from 12 to 15 of June, 2018. SnapSwap presents innovative Digital Onboarding solution Snaprove (™) at Money 20/20, the European largest Fintech event, which takes place in Amsterdam from June 4th to 6th. The event welcomes 5,000 attendees from more than 1,500 companies and 80 countries, among them major international banks, payment and technology providers, Fintech companies. SnapSwap CEO Denis Kiselev will be on stage on the 6th of June at 9:20 am with public interview by Mélisande Mual, the editor of the Paypers, one of the leading European news media in the area of payments. Please follow the event updates to attend SnapSwap pitch in the Money 20/20 Startup Academy, a special event track for selected startups. SnapSwap joins a cohort of later-stage fintech and tech startups selected by Mastercard for its Start Path virtual mentorship program. In this program, Mastercard will help startups in security, banking, data intelligence or from other domains, to solve key operational challenges. Mastercard Start Path is a global effort to support later-stage fintech and tech startups who are shaping the future of commerce. During the 6-month virtual program, the startups will be introduced to Mastercard experts and partners. The Start Path team works with startups against a tailored plan that will deliver tangible value and help these companies to scale. It is completed by two immersion weeks to create the tailored plan for each startup and meet Mastercard's partners and network. The first immersion week took place in Dubai from 16 to 18 April. This participation is the occasion for SnapSwap to develop its business and to have access to experts and resources from across the organization. It will be the opportunity to dive deep with internal and external network of Mastercard. Since launch, the Start Path team has engaged more than 170 startups from across all geographic regions. SnapSwap has the pleasure to participate in FARAD Finance Forum, and discuss about Snaprove™ onboarding solution at the FinTech panel focused on the hottest technological trends in banking: next-generation services and the quest of a multidimensional customer experience. FARAD Finance Forum gathers Luxembourg financial industry’s professionals for a day of conferences and thematic sessions to give attendees an insight on how technical, regulatory, economic and attitudes changes are impacting the way business is done and what the future of Luxembourg financial place holds. The Forum’s main subject will be: “Feeding the Future! Luxembourg Financial Place is changing, don’t get left behind.” The event expects more than 300 participants from Luxembourg core industries: funds, finance and insurance.